I’d been thinking for some time about the tendency for technology to kill jobs (including mine, after thirty years in journalism) and where this trend might lead, as populations continue to grow. I’d also been thinking about the conflicting needs of the economy and the environment – how our economic system depends on growth, but that same growth is bad for the Earth. It seemed obvious that, sooner or later, we would have to confront these dilemmas and change the way we lived. But it was equally obvious that we weren’t going to give up our easy lifestyles, not voluntarily anyway. We are only human, after all. And then one day I was reading a United Nations report about this very subject – an attempt to resolve the growth-versus-environment issue – when I saw a chart that, according to the authors, showed how world growth had begun to ‘decouple’ from natural-resource depletion. The authors thought this a hopeful sign, though they couldn’t explain why it was happening. The real reason for this apparent decoupling seemed clear to me however, because it indicated something I’d been expecting, and unfortunately it wasn’t the hopeful sign the report’s authors had been looking for. What it was showing, I reckoned, was the failure of the economic system that had made the west wealthy. 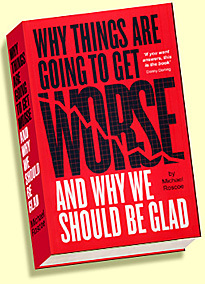 So in this book I investigate the reasons for this failure and try to explain what’s really gone wrong with the global economy, why we haven’t seen the worst yet, and why, despite all the hardship and tough years to come, we should be glad that the boom times are over and we are forced to confront the real issues – issues that were bound to blow up anyway, one way or another. In the last few years, following the financial crash of 2008, economic problems have taken over from terrorism and war as the biggest threat to our western way of life. For the first time in over half a century, the majority of Europeans and Americans are getting poorer – not just a bit of belt-tightening due to a cyclical recession, but a real decline in earnings. And it’s going to get worse, especially in Europe. Much has been said about the financial crash, the folly and greed of bankers, sub-prime loans and the Eurozone crisis, but these are all symptoms rather than causes, and very little has been said about the causes. It’s almost as if most economists and politicians have lost sight of certain fundamental truths about life, as if these truths fly below everyone’s radar; too simple and too obvious to register in the sophisticated, high-tech world in which we live. By the end of the 20th century we’d become accustomed to the idea that the world was on a continuous path to ever-greater prosperity, and even though it might make a few dips along the way, and although not everyone might be very far along it yet, the path would keep rising. Anyone who questioned how long it could do so was considered a bit cranky, dismissed as an eco-warrior or tree-hugger. The general consensus was that free-market capitalism was the best system to ensure this prosperity, that it would always provide jobs for those willing to work and that economic growth was not only a necessary part of the system, but desirable in itself. This system had gradually taken over the world, was considered superior to other economic systems because it appeared to work where others had failed – it ruled by default. And as long as it appeared to work, even supposedly communist governments such as China’s seemed happy to embrace it. But free-market capitalism has one slight problem in its purest form, the form we’ve been heading towards for some decades now. Like any greedy animal, human or otherwise, its need for continuous growth will inevitably lead to its own destruction. It must literally consume itself to death, not just because it will eventually run out of resources – that is a potential problem, certainly – but before that happens there is another major failing that will kill the growth, and therefore kill the system. The process has already begun. This self-destructive tendency of free-market capitalism just happens to be our best hope regarding the long-term survival of civilization, but in the meantime we will have to endure a period of considerable hardship, because the inevitable result of the system’s failure is mass unemployment. Why should free-market capitalism lead to mass unemployment? Because the growth on which the system depends is reliant on the ever-increasing productivity of industry, a process that’s been going on for centuries and which new technology seems capable of delivering, and even accelerating, for the foreseeable future. In the past, workers who lost their jobs in agriculture found work in the new manufacturing industries, and when these industries in turn shed workers, as they have been doing over the last thirty years or more, jobs were created in the booming service sector. Not always enough jobs, perhaps, but in the post-war boom the economies of the west had become wealthy enough to ensure that the unemployed received a payment while they looked for other work, successfully or otherwise. Now, however, we appear to have arrived at that point where ever-increasing productivity reaches its logical conclusion; there is no longer enough work to go round. The service sector cannot create more jobs, because services are dependent on the wealth created by manufacturing, which itself is dependent on the natural wealth of the earth. And the public sector can no longer take up the slack because governments have overburdened themselves with debt – debt that will kill any prospect of real growth for many years to come, while making us all poorer in the process, as the inevitable inflation takes hold. The seeds for this self-destruction of the system were sown in 1971, when the US government severed the link between the dollar and gold, but the effect of this move was masked for three decades by the steady growth in western economies, fuelled by international oil money and the US-led boom in technology – the same technology that now plays a major part in the system’s demise. 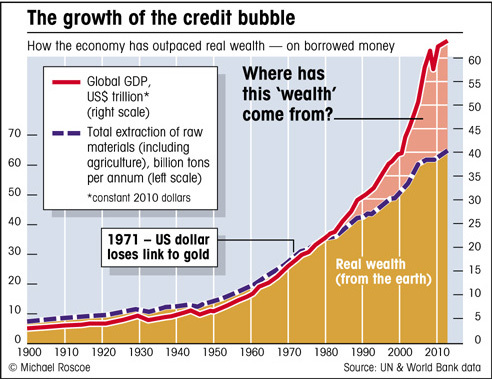 The final growth spurt came as the 20th century neared its end, powered this time by the huge expansion of the financial sector, a non-productive ‘industry’ that feeds off the accumulated wealth of real industry, like a giant parasite whose life-blood is credit. Apart from those directly affected, hardly anyone seemed worried about the decline of jobs in the wealth-creating sectors of the economy. Some even thought we’d entered a post-industrial age where wealth could be conjured out of nothing. And as long as the good times were rolling, who cared? So what if the boom times of the last decades were fuelled by debt, or if finance had ballooned into a major sector of the economy by trading in nothing more than bets and promises? Hardly anyone questioned what gave money its value and how this value could be assured, when there was no longer anything to measure it against; when in fact, as with the financial sector as a whole, the value of money, since 1971, has been based on nothing more than trust. But as we are about to discover, trust and promises can be broken, will be broken. The system itself is broken, and in this book I endeavor to explain why, even to show why in graphic form. It was thanks to graphs – and to one chart in particular [shown above] – that the truth about wealth and values first hit me, enabled me to see clearly what had until then been only a vague idea in the back of my mind. So I use charts to illustrate my reasoning; to cut through the fog of economic jargon and show what’s going on at ground level, where, whatever great heights technology might reach, the foundations of the economy still rest. If there is one fundamental truth that sums up the problem, it is this: real wealth creation requires real work, and real work must involve the transformation of nature’s raw materials into something of value to us humans. There is no other way to create wealth. I have a feeling that, beneath all the financial wizardry and the complexity of the global marketplace, this simple truth has been lost. In the opening chapters I explain in more detail the points touched on above, and in subsequent chapters I delve more deeply into the reasons why we find ourselves at this critical stage in the development of civilization. My aim is to give convincing arguments as to why we must remodel our economic system to fit the reality of today’s world, or be prepared to suffer the consequences as the whole thing collapses around us. The financial crash of 2008 should be seen as a warning; a tremor in the foundations of the free-market system. The real earthquake is still to come.